Belkin SurgeMaster 6 Outlet Wall-Mount Surge Protector Only $8.45 (Reg. $19.99)! 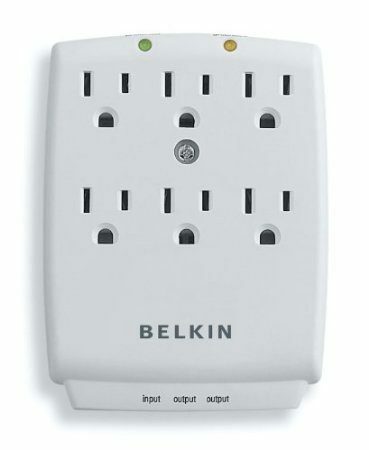 You are here: Home / Great Deals / Amazon Deals / Belkin SurgeMaster 6 Outlet Wall-Mount Surge Protector Only $8.45 (Reg. $19.99)! If you have too many plugs for your wall outlet, this deal is for you! Right now, you can get this Belkin SurgeMaster 6 Outlet Wall-Mount Surge Protector for just $8.45 (reg. $19.99)! And, shipping is FREE with Amazon Prime or Super Saver Shipping! We’re using an extension cord right now in our living room, so I’m grabbing this. It will mean not tripping over a cord anymore!